Spheres show up everywhere in life and for that reason it is essential that an artist be able to render each part of a spherical form well. 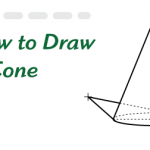 In today’s post I reveal the 4 parts to a sphere drawing so that you can draw spheres with realistic precision. 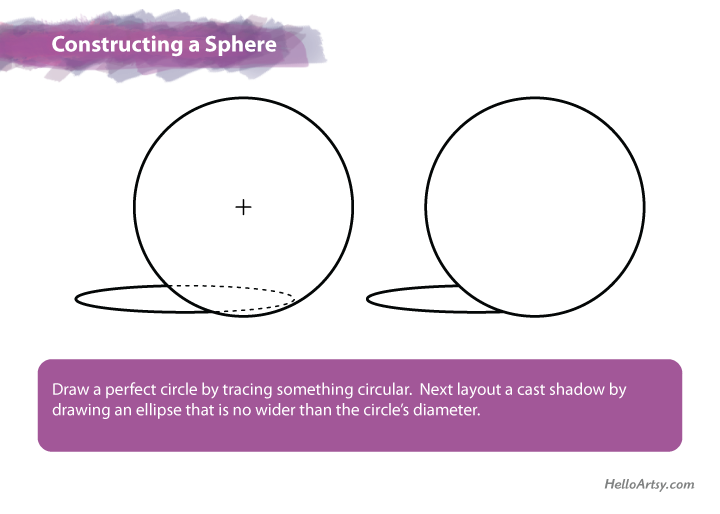 To draw a sphere or any ball like form, start off with a perfect circle. Use a compass or trace something perfectly round like a can of soup. 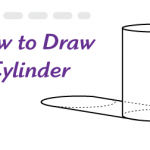 Draw lightly because you want the circle to disappear later leaving the sphere with no outlines. The sphere’s cast shadow is nothing more than an elliptical shape positioned horizontally. Make sure the diameter of the cast shadow is very close in length to the circle’s diameter otherwise the cast shadow will not look like it belongs to the sphere. 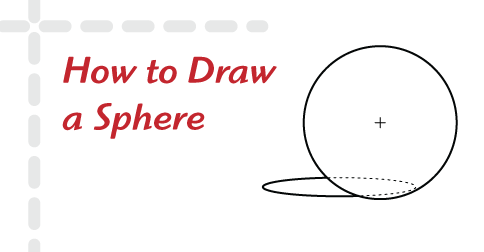 Shading the sphere / ball is very difficult to do and will most likely require much practice if you are new to drawing. The sphere will consist of 2 radial gradations. 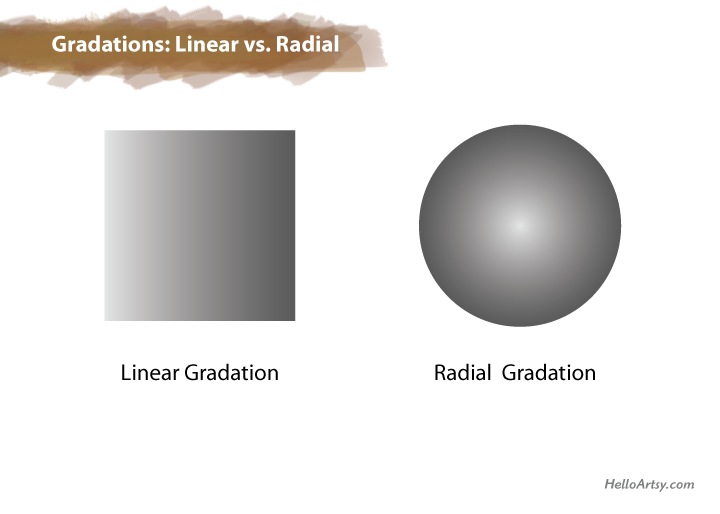 A radial gradation is a value transition that changes from a lighter to darker value in a circular fashion radiating out from a central point. See the diagram below for a comparison of the more common linear gradation, which is precisely what you used to draw a cylinder. Under a normal, single source of light, a sphere will contain a single highlight, which will not be located on the sphere’s edge but inward slightly. This is the location that reflects the most light back towards the viewer and as a result the highlight appears the lightest in value compared with the other parts of the sphere drawing. Imagine a point being located in the center of the highlight and each time you visually move away from that point the value of the sphere gets darker. Eventually you will arrive at the sphere’s darkest value, which is called the core shadow. The core shadow is the darkest value on the form and resembles a crescent shape much like a crescent moon. Like the highlight, the core shadow should not be sitting against the outer edge of the circle that defines the outer edge of the sphere. Rather, the core shadow leaves a small space between itself and the edge of the sphere, which is taken up by the reflected light. The reflected light is the 2nd gradation incorporated into the drawing of the sphere. 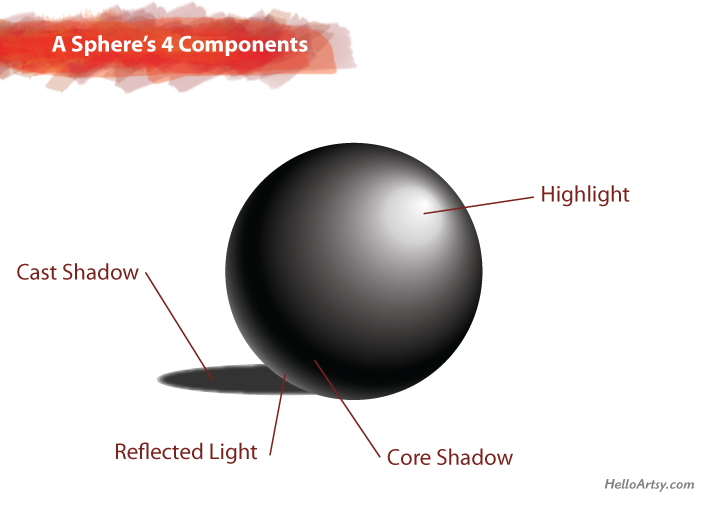 To draw the reflected light, you must gradate from the darkest part of the core shadow to a medium value along the outer edge of the sphere just outside the core shadow. This will require much practice and a sensitive eye and hand to accomplish but, without the reflected light a drawing of a sphere will look flat and not very realistic. In reality, a cast shadow is highly affected by the objects around it, but for now let’s shade in the cast shadow as a medium-dark value and soften up it’s edge ever so slightly. This will be good enough for practicing and when you are faced with drawing an actual sphere-like object from direct observation, you can study the cast shadow a little more closely for subtle changes in value. 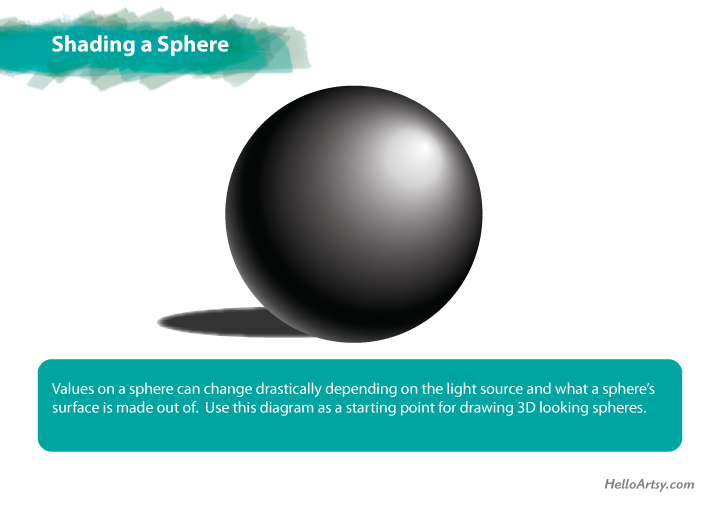 By now you have identified where to draw the 4 components of the sphere. 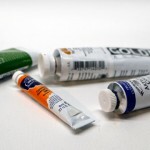 It’s important to be able to identify these components so that you can draw them accurately in your drawings and paintings. Attempting to draw a sphere just by pure sight is difficult. Always attempt a drawing with some mental understanding as to what forms you are dealing with. Keep in mind the location of your light source and where you would expect each of the 4 components to be positioned and drawing a sphere will be far easier and you’ll get better results! Please remember that the highlight, core shadow, reflected light, and cast shadow do move around depending on where the light source is located and what a sphere’s surface is composed of. Take some time today and look for spheres in the world around you. If you’re willing to look, you will see sphere’s everywhere and if not by themselves, they will often be part of a more complex conglomeration of forms. Remember the pear fruit? It’s made from spheres and a cone. Objects can also be sphere-like and not so obviously a sphere; the human head is a perfect example of a form that is spherical in nature, but by no means a perfect sphere. Where do you see spheres in your world? Let us know below! Why does the cast shadow not touch the bottom of the sphere? It should be. 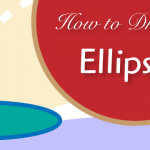 This is just a simple graphic to get beginners started in the right direction. I thought my eyes were deceiving me. Lol! Very helpful response , thank you! You’re welcome, thanks for visiting the blog! Excellent List, very insightful indeed! Oh yes I have more! Thank you Peg, sphere’s can get complicated but I tried to keep it very simple here!